This DVD series by ARTS.21 introduces four young architect teams (FAR Frohn & Rojas architects, Plasma Studio, behet bondzio lin architects and GRAFT architects) enjoying their first experiences in foreign climes. DW-TV accompanies architects to their construction sites around the world and gets an insiders view of the new buildings. 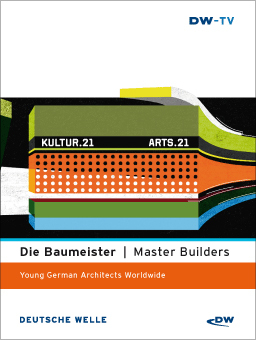 KULTUR.21 stellt in der Serie “Die Baumeister – Deutsche Architekten weltweit” vier junge Architektenteams (FAR Frohn & Rojas Architekten, Plasma Studio, behet bondzio lin Architekten und GRAFT Architekten) vor, die ihre ersten internationalen Erfahrungen sammeln.